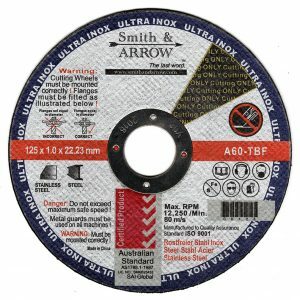 Excellent for cutting stainless steel, mild / black steel and all metal. 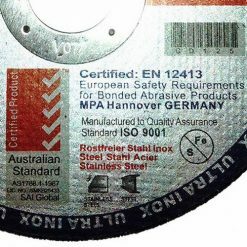 Also good for aluminium fabricators. 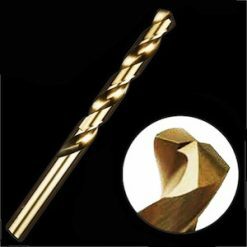 This is a commercial grade product that is of superior quality – INOX quality which is of the highest level. 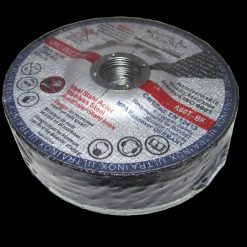 Please check our feedback for proof of our quality. 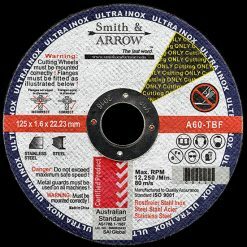 Smith & ARROW Cutting Discs have a reputation as long-lasting, fast-cutting discs, effective across all types of metal and steel. 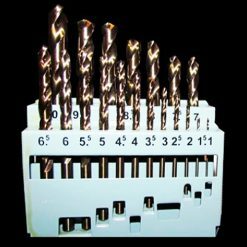 They are designed to cut quickly with minimal wear. 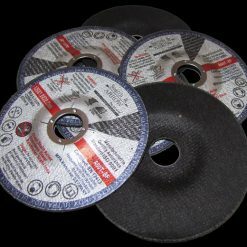 We sell a range of sizes and thicknesses of cutting discs to suit all angle grinders, drop saws, and die grinders. 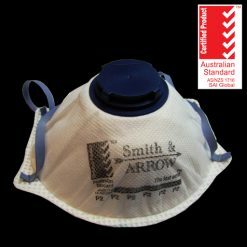 Smith & ARROW is an international company that specifically engineers their products for rigorous commercial use. 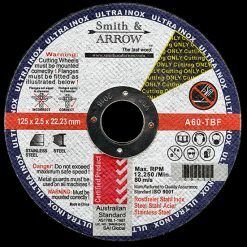 With a focus on manufacturing abrasives for the metal fabrication industry, Smith & ARROW has gone from strength to strength developing products of the highest quality for distribution to the four corners of the globe. 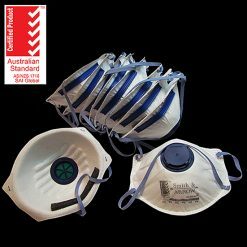 We are constantly developing new products to add to our range. 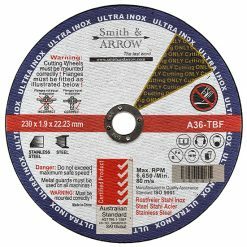 Our dedication to delivering high quality abrasives at exceptional prices to our customers, both large and small, is underpinned by a customer service ethos second to none. 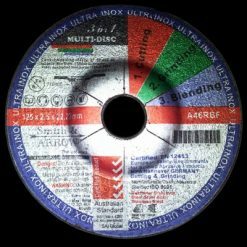 We deliver the highest quality, the best prices and exceptional service – our customers are everything to us. 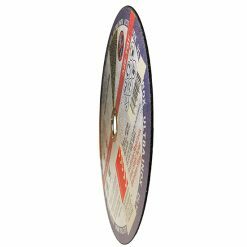 @1 service arrived on date provided.Have used this service before Quality is very good. Boys in the workshop have asked me to order again. Not as good as the best but 90% as good for half the price. Tested with a 3mm rod of mild steel and it cut cleanly and quickly. Satisfied with the result and would order again. Quality cut-offs. I will shop here again.